The main feature is Carl Theodor Dreyer’s The Bride of Glomdal (Glomdalsbruden) (1926). 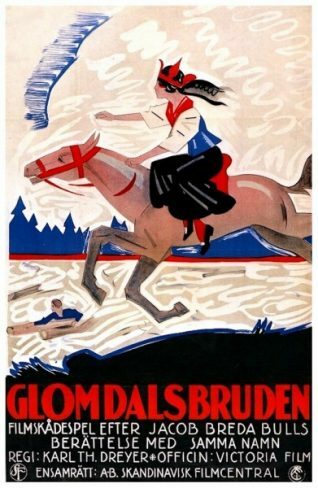 Among the highlights of the recent Pordenone Silent Film Festival were the examples of Norwegian cinema, perhaps most notably Carl Theodor Dreyer’s adaptation of a novel by Jacob Breda Bull, The Bride of Glomdal (Glomdalsbruden). To accommodate the theatre schedules of his actors, and to embellish what he believed to be the relatively slender plot threads of the original, Dreyer uncharacteristically shot more or less off-the-cuff, albeit with a prepared list of scenes, throughout the summer of 1925. The rural locations provide a beautiful setting for this story of Tore, a young farmer, who is determined to build up his family’s dilapidated farm and win the hand of lovely neighbour Berit, who is promised in marriage to another. The Bride of Glomdal immediately followed Dreyer’s early important work Master of the House (Denmark 1925) and preceded his move to France, where his international reputation was made with The Passion of Joan of Arc (1928).